A R T & D E S I G N b y c a n d a c e b r e k k e : New features on my Uppercase Living website!!! I'm so excited! 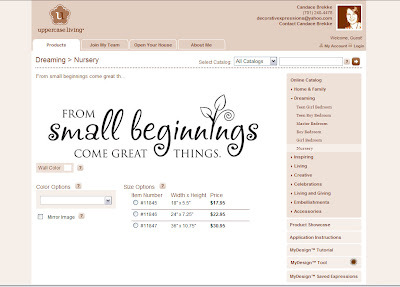 The product catalog has changed on my personal Uppercase Living website! Now, you can see the products in each catagory and then click on it for even more details. It will give you the size options (so you can measure your space at home) and prices. It even allows you to choose your background colors and letter colors. Isn't that fantastic? Whoo Hoo!! At this time, you will still have to contact me to place your order. I am going to gauge the interest of online shopping before I subscribe and start paying for that option. So, if you want to order, you'll still have to either email me or give me a call.